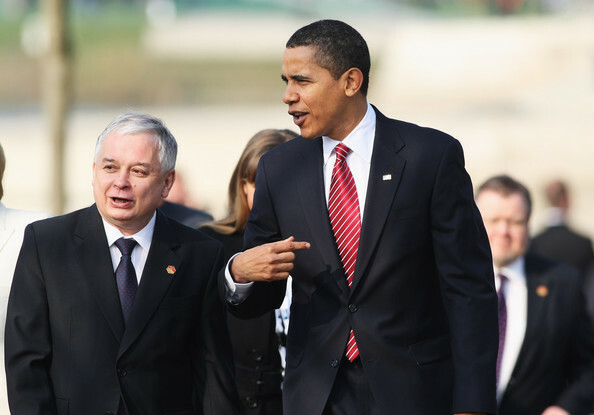 U.S. President Barack Obama and Polish President Lech Kaczynski arrive for a military ceremony during the NATO summit at the Passerelle des Deux-Rives on April 4, 2009 in Kehl, Germany. (WHITE HOUSE.GOV) I spoke with acting President Komorowski and told him that I regret that I will not be able to make it to Poland due to the volcanic ash that is disrupting air travel over Europe. Michelle and I continue to have the Polish people in our thoughts and prayers, and will support them in any way I can as they recover from this terrible tragedy. President Kaczynski was a patriot and close friend and ally of the United States, as were those who died alongside him, and the American people will never forget the lives they led.